Q: Who puts on the Mount Horeb Summer Frolic? A: The four-day event is organized by the Mount Horeb Summer Frolic Committee, with support from numerous service organizations in the village along with the Mount Horeb Area Chamber of Commerce. All proceeds from the Frolic are distributed among these organizations, which then return them to the community through various projects and initiatives. Q: Where do the rides and games come from? A: Mr. Ed’s Magical Midway Carnival, based in North Freedom, Wis., provides rides, games and food stands at the Frolic. Q: What food options are available? A: In addition to culinary carnival favorites like cotton candy, snow cones and elephant ears, the Mount Horeb Rotary Club runs a grill offering burgers, grilled cheese and hot dogs in the lower shelter. There are also a variety of foods for sale in the beer tent, including steak sandwiches, walking tacos and brats. Q: Is there an ATM on site? A: Yes. Service charges will apply. Q: What are my restroom options? A: Men’s and women’s restrooms are available in the lower shelter. There will be an array of port-a-potties outside the beer tent, with a few other port-a-potties placed throughout the grounds. Q: What should someone do in the event of a lost child or other emergency? A: Frolic volunteers will be roaming the grounds with radios, but the best place to alert everyone of an emergency is to report it at the Chamber tent at the top of the hill, just outside the beer tent, or the beer tent ticket sales trailer, also at the top of the hill. Q: When is the beer tent open? A: Thursday, 5–10 p.m.; Friday, 5 p.m.–1 a.m.; Saturday, noon–1 a.m.; Sunday, noon–8 p.m.
Q. What kinds of beer will be available? A: We’ll have a mix of domestic and craft beers, with some alternative alcoholic beverages like wine and cider. Q. What bands will be playing? A: View the band lineup on our Live Entertainment page. A: There will be a $5 cover charge on Friday and Saturday nights beginning at 7 p.m.
Q: When will the midway rides and games be open? A: Rides and games will be open 5–10 p.m. Thursday, 5–10 p.m. Friday, noon–10 p.m. Saturday, and noon–5 p.m. Sunday. Q: How much do rides cost? A: Each ride costs a certain number of individual tickets (generally between two and four), which can be purchased on Frolic grounds. Advance sale tickets, good for a single ride (regardless of number of tickets required), are also sold before the festival begins. View ticket information on our Carnival page. Q: Where can advance sale tickets be purchased? A: Advance sale tickets are available beginning in late May at Miller & Sons Supermarket and Old National Bank. They can be purchased through Wednesday, June 5, while supplies last. A: Wristbands are $20 and good Thursday 5–10 p.m. and Saturday noon–5 p.m. A different wristband must be purchased for each day. 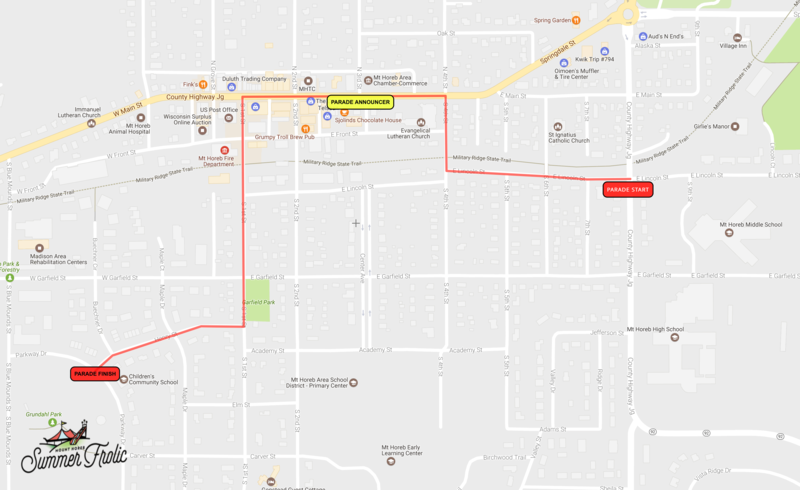 Q: What is the parade route? A: Sunday, beginning at noon. Q: Where are the best spots to watch the parade? A: An announcer will be describing the various parade entries from the 300 block of East Main Street. Parade watchers are invited to pull up a chair along Main Street or anywhere else on the route. Q: How can I get my organization in the parade? A: The parade registration form will be available soon on our Parade page. Entries must be received by June 5. Q: Is there a cost to enter the parade? A: There is a $50 entry fee, which is waived for nonprofit organizations. Q: What prizes are going to be raffled off? A: View the full list of prizes on our Raffle page. Q: How much do raffle tickets cost? A: $10 each, or 3 for $20. Q: Where can I buy raffle tickets? A: Raffle tickets can be purchased in advance at the Mount Horeb Area Chamber of Commerce Welcome Center on Main Street, Miller & Sons Supermarket in Mount Horeb, Old National Bank in Mount Horeb, or from any Chamber board member. Buy tickets during the Frolic by visiting the Chamber tent, at the top of the hill adjacent to the beer tent. Q: When is the grand prize drawing? A: Sunday at 4 p.m.
Q: Do you have to be present to win? A: No. Winners not present to claim their prize will be contacted using the information provided on their tickets. Q: When will BINGO be taking place? A: Thursday, 6–9 p.m.; Friday, 6–10 p.m.; Saturday, 1–5 p.m. and 6–10 p.m.; and Sunday after the conclusion of the parade (around 1 p.m.) until 4 p.m.
A: Fifty cents per card, with several $1 card games mixed in for double the payout. Q: What are the BINGO prizes? A: Prizes will depend on the number of players; during peak playing hours, the pot is usually around $40 to $50, or double that during the dollar games. Pots can reach as high as $150. Q: Who runs the BINGO tent? A: The Mount Horeb Lions Club. Anyone wishing to volunteer as a BINGO caller or in another capacity should contact Lion Todd Vieau at 608-286-9030 or toddvieau@gmail.com. Q: When are the fireworks? A: Saturday night at 10 p.m.
A: In the event of inclement weather, the fireworks will be canceled. They will not be rescheduled.